According to the USDA, in 2013 approximately 34 million dairy and beef calves were born in the United States. Cows normally give birth to one calf at a time approximately nine months after mating, but twins are possible. Calves can be born year-round. How they are raised depends upon their ultimate use: dairy farming, beef ranching or veal production. Calves weight approximately 60 to 100 pounds at birth. Within an hour of birth, they stand, walk and nurse. The first milk produced by the cow is called colostrum. It contains vital nutrients and antibodies for the calf's well-being, and the calf must receive colostrum in order to be healthy as an adult. Calves must be kept with their mothers for at least 48 hours to ensure they receive adequate colostrum. Dairy calves are kept with their mothers for a few days to ensure they receive adequate colostrum and protein from her milk. After this period, calves are weaned by removing them from the pastures in which their mothers are kept. They are moved to locations where the mothers cannot see or hear the calves. Commercial milk replacers, usually a powder mixed with water, are fed to the calf using a bottle or a pail. Calves begin eating grass at approximately 2 to 4 weeks of age. After age 4 weeks, they can be moved completely onto a good quality pasture and receive adequate nutrition. Beef calves tend to be heavier at birth. Calves drink about 1 gallon of milk per day. Beef calves are weaned when they are 6 to 10 months old. At this time, they weigh 450 pounds or more. Young calves then enter the stocker and backgrounder phases, in which they are left in open fields to graze at will and gain weight. Males and females may be sent to auction, where they are purchased by stockyards and feed lots for final weight gain before slaughter. Females may be retained by the farmer or rancher for future breeding. Veal calves are primarily Holstein calves. Because Holsteins are dairy breeds, female calves are kept for future milk production, whereas males are often sold at birth for veal products. Newborn veal calves are called bobs and may be slaughtered any time between birth to age 3 weeks for their meat. 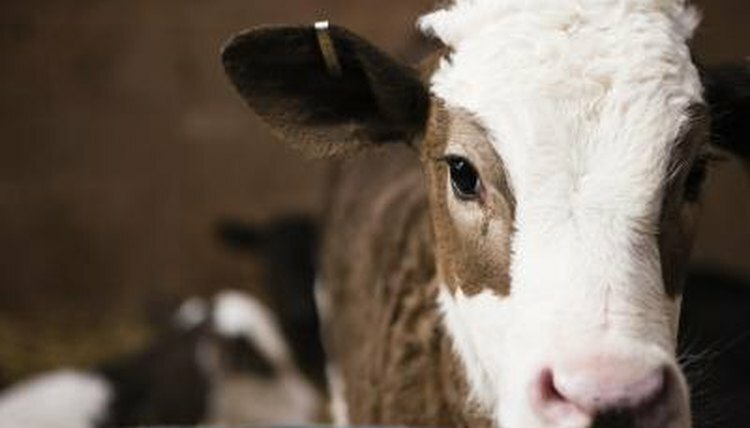 Milk-fed veal calves have a low-iron diet to produce white meat. "Free-range" veal calves stay with their mothers, feed on her milk and roam freely in large pastures before being slaughtered at 24 weeks.